Rare opportunity! Beautiful lakefront mid-century modern on 2 lots in Downtown/Thornton Park! This exceptionally maintained, one level, 3-bed, 3-bath on an oversized corner lot and quiet cul-de-sac has been carefully restored and features many upgrades: new designer spa-like bathrooms with Italian porcelain and custom cabinets with undermount lighting and floating quartz countertops, restored original terrazzo floors, freshly painted exterior, double hung insulated windows, custom electric driveway gate, upgraded kitchen with granite countertops & solid maple cabinetry, stainless appliances, generous storage throughout including 2 large walk in cedar lined closets. Stunning and bright panoramic views of the lake from the open concept family/living/dining rooms. Great outdoor space, large fenced side yard perfect for play and pets, watch the wildlife and sunsets from a lakefront platform or the elevated terrace constructed of Pennsylvania Blue flagstone. Concrete seawall along lakefront. Lushly landscaped yard, 9 zone irrigation system, a gated and fenced side deck area and covered front porch perfect for entertaining. Enjoy the beauty and serenity of Lake Olive and still be in the heart of downtown! Fantastic walkability to shops, restaurants, entertainment venues and parks. 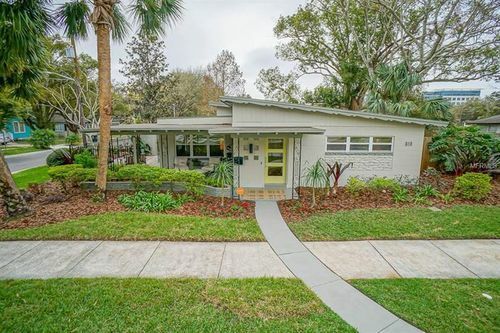 Don't miss out on this rare opportunity to live, work and play in a mid-century modern slice of lakefront heaven conveniently located to everything downtown Orlando/Thornton Park has to offer! Check out walk-thru video.